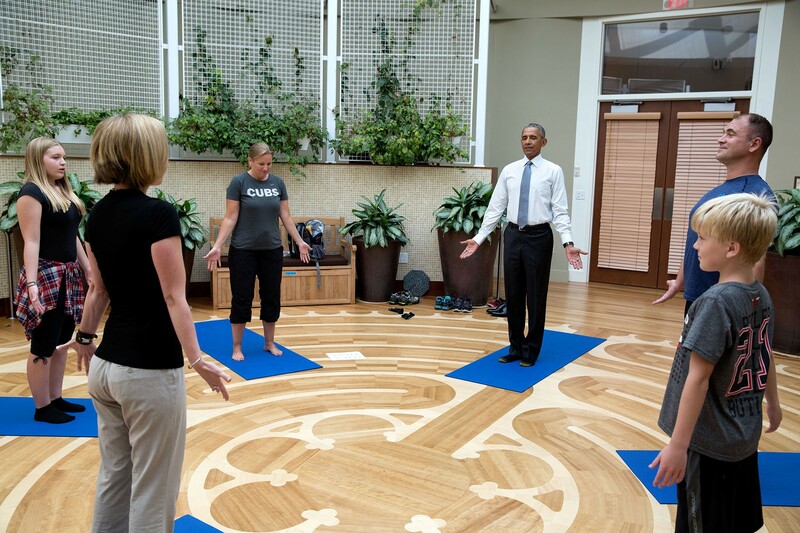 Allison Winters leading President Obama in a Yoga session. 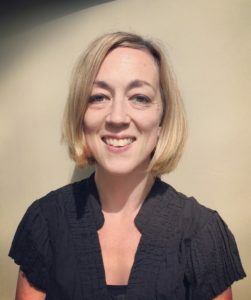 As a Ph.D. student in Saybrook University’s Integrative Medicine and Health Sciences, I was recently asked to write a blog piece about my experience as a dance therapist that treats military and veteran patients. As I reflected on where I am, I realized that it is just as important to understand the roots of my journey. When I started pursuing a career as a dance therapist, I didn’t know that I wanted to work with this population. I knew very little about veterans or military life, other than the fact that both of my grandfathers and two of my uncles had served. Yet when I began working with veterans, I felt this connection that I could not ignore. I may not be serving in the military in the traditional sense, but it is my hope that I am able to help veterans find a sense of peace and healing. My first job as a dance/movement therapist was facilitating groups on inpatient psychiatric units in a hospital in New York City. It was exhausting but fulfilling. I had the privilege of sharing in patients’ most intimate and darkest experiences. Joining them on their journey taught me how to be empathic—not only in therapeutic relationships, but with all beings. In short, they taught me much of what I understand today about the human condition. I remember one patient in particular who had been on the unit for months. He was chronically schizophrenic and homeless. Finding a more permanent placement for him was proving to be a challenge. He spent the days pacing the unit and mumbling to himself—visibly responding to internal stimuli through gestures, facial expressions, and physical postures. I always invited him into the groups, even though he never indicated any signs of being interested. He never made eye contact with me, or anyone on the unit. Sometimes he would come into the group space and sit for a little while, but it didn’t take long before he was up and pacing again. Although he would come and go, I always made sure to welcome him warmly and greet him by his name. The day finally came when a placement had been found for him, and a discharge date had been decided. During our time together, I noticed that one of the things that kept him going was the few cups of coffee that he received with his meals. So a few days before he left, I asked the psychiatrist if she would mind if I gave the patient a really good cup of coffee from a local coffee shop to bid him farewell and celebrate his moving on from the hospital. She agreed and the patient happily accepted his large cup of non-hospital cafeteria coffee. The day the patient left, I went to say goodbye and wish him well. He looked me in the eyes for the first time in four months and spoke the only words he ever said during that time, “You saved my life.” He then quickly leaned forward and kissed me on the cheek before hurrying away. He left behind a very stunned therapist. It would’ve been easy for me to ignore this man as he paced and mumbled to himself all day. Instead I treated him as I did everyone else, and guess what? There was a living, breathing, feeling human being inside that rough exterior. I reflect back on this experience often, carrying these deeply embedded lessons with me into every new therapeutic relationship. 1) Don’t make assumptions about others; you can never truly know what is going on inside of them. 2) Be your authentic self with people, and most of the time that is what you will receive in return. A couple of years into my work on the psych units, I became aware of a job opening at a local Veterans Affairs (VA) medical center. As I stated before, I knew very little about veterans or military life. For some reason, however, I felt drawn to the job, so I applied. Shortly thereafter I was called in for an interview. Initially, I felt entirely undeserving to be asking for a job to treat veterans, and was overwhelmed as I entered the “official-looking” entryway to the VA. Yet, there was a part of me that felt comfortable among the camouflaged and weapon-laden guards. Eventually, I was hired as a creative arts therapist working in their Community Living Center (CLC), a nursing home. The patients were mostly confined to wheelchairs, and many were suffering from dementia as well as other comorbidities—such as depression, post-traumatic stress disorder, and Parkinson’s Disease. These were World War II and Korean War Veterans: Soldiers who had long since seen a battlefield, but whose war stories were still very much alive in their bodies and minds. You might be wondering how I engaged these patients in dance. Let’s start by clarifying a few things about dance/movement therapy (DMT). It is a common misconception that DMT has to do with dance in the traditional sense—that is learning a specific sequence of movements within the style of a particular dance technique such as ballet or modern dance. While a DMT session may incorporate dance technique, it is more likely that it won’t look like a dance class at all. What happens in a DMT session largely depends on the person or group of people in the session: It is the patients’ needs that drive the session. A dance/movement therapist is trained to use movement as a means of both analysis and treatment. There was a man at the CLC who spent the entirety of his day in a Broda chair (similar to a reclined wheelchair). I started by sitting with him and attempting various ways of communicating. He couldn’t speak very well, had limited range of movement, and diminished muscle capacity. After a few sessions together and trying a few different stimuli, I discovered that he could toss a ball back and forth with some force. I will never forget the look on the nurses’ faces when they walked by and saw this man moving with power and intention. Upon further exploration, I found that this same man loved music and expressed his adoration by rhythmically tapping his big toe along to the beat. Sometimes, I would help accentuate the feeling for him by gently tapping the same rhythm on his leg or arm so that he could feel it more completely. DMT is about being with the patient—wherever they are—and moving with them in a way that is meaningful. What makes it therapy, and not just dance, is the relationship between the patient and the dance/movement therapist. As this man’s therapist, I was aware of his diagnoses, psycho-social history, and physical limitations. I kept all this information in mind when I interacted with him, but what elicited his movement responses was the fact that I was being present with both his mind and his body. To an outsider it may seem that his movements were subtle and perhaps inconsequential, but to those that knew him, those movements were as extraordinary as a grand jete by Barishnikov himself. While working at the VA CLC, I met a man who happened to be on the same aircraft carrier as my grandfather during World War II. I wasn’t able to share this amazing connection with my grandfather as he recently passed away. But I was able to deepen my connection with him through my conversations with this veteran. In fact, meeting this man who served alongside my grandfather made me feel connected across generations of warriors. I suddenly understood my own duty to serve and to continue passing this honor on to future generations. It was at that moment that I understood my calling was to serve those who have served. The time came to move on from the Community Living Center when I received a job offer from a military medical facility in San Diego, CA. It was difficult to leave these Veterans behind as I had grown to truly care for them. At the same time, I was excited to work with active duty military members—to learn about another area of the spectrum of military life. San Diego also happened to be the port that my grandfather’s ship deployed from: The thread of personal meaning would continue as I journeyed to the other side of the country. The patient population that I was assigned to work with were receiving treatment for multiple diagnoses, including substance abuse, depression, anxiety, and PTSD. Although joined by their military experience, these men and women were facing a whole different set of challenges than the CLC Veterans. As active duty service members, their primary goal was still the mission. Recovery was important but only for the sake of being ready for their next order. Their needs were also different than the CLC patients from a physical perspective. Just as I did with the CLC Veterans, I met them where they were at, but with these soldiers I had to be prepared to respond to them with a different kind of readiness. The CLC veterans were in their last stages of life and my goal was to support them in finding moments of contentment, peace, connection, and relief from pain. With the active duty members, I supported their therapeutic goals by teaching them mind-body skills that they could carry with them and continue to utilize wherever the mission may take them. This was also the time in my career when Saybrook University and I found each other. At the same time I was moving, breathing, and exploring with military soldiers, I was undergoing my own training, deepening my knowledge and understanding of mind-body skills alongside my own army of wellness warriors. During my time in San Diego, I was asked by the American Dance Therapy Association (ADTA) to participate in their ADTA Talks. The project was based on the popular TED Talk series and the result was several dance/movement therapists coming together to talk about how they utilize their skills with various patient populations. As you might imagine, this is a question I am asked often. What I said in the talk and what I continue to tell people today is that when provided with a safe space and given the permission to move in their own way and in their own time, walls of resistance come down quickly. DMT isn’t about forcing anyone to dance, it is about allowing space for people to feel comfortable in their own skin. It is about empowering them to make meaningful choices for their health and wellbeing. It wasn’t about teaching dance moves, but about moving with each other in a meaningful way. Sometimes it might be adjusting your own pace to walk alongside someone or sitting with someone in silence. Once the service members allowed themselves to be in their bodies, they understood dance/movement therapy. I eventually parted ways with San Diego, but before leaving, I spent some time looking out at the San Diego Bay—watching the Navy ships and submarines come and go. I wondered if, as his ship deployed to the Pacific Islands, my grandfather took a moment to look back to the shore—gazing at the same place where I was sitting. The next stop on my journey was a little farther north at another Veterans Affairs CLC in Palo Alto, Calif. (VAPAHCS). During my time there I continued to use my DMT skills to help increase the quality of veterans’ end of life experiences. It was also during this time that Michelle Obama challenged America to dance as part of her “Gimme Five” initiative. She performed a short piece of choreography with Ellen DeGeneres on the Ellen Show and encouraged people to film themselves performing the dance and then to share it on social media. I thought it would be a perfect opportunity to encourage both patients and staff to dance. With some help from my student intern and some other dedicated colleagues, we were able to capture footage of patients and staff taking the First Lady’s challenge. Our message was that every BODY can dance, even if you are confined to a wheelchair. The resulting video was released on the VA’s Facebook page and still lives there today. I am now back on the East Coast working with active duty service members again as the wellness coordinator in an integrative traumatic brain injury treatment program. I have had the opportunity to create and implement a mind-body program, focused on providing service members with the skills to manage and maintain their health and wellness regardless of where the mission may take them next. As I help service members build their skills, I continue to build my own as well as I move toward the end of my doctoral studies at Saybrook. I may not have experienced war firsthand, but I have certainly felt the range of human emotion. This is why the story of the man on the psych unit in New York stays with me. Our emotions are what connect us, and we all feel our emotions in our bodies. Allison Winters is a Ph.D. student in Saybrook University’s Mind-Body Medicine program. Currently, she works as the Wellness Coordinator at an integrative traumatic brain injury program, where she uses Dance/Movement Therapy to help veterans manage and maintain wellness. She and her life dance partner, Doug, are currently cutting loose in Silver Spring, MD with their two tiny dancers, Charlie and Lily.